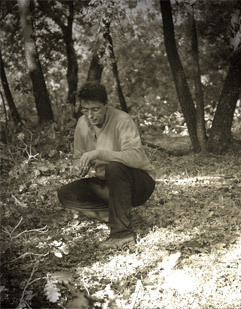 This website is a tribute to Gianluigi Gasparetti (1958–2013), the italian ambient composer best known by the pseudonym Oöphoi. He was perhaps best known for his role as the editor of Deep Listenings, an Italian magazine dedicated to ambient and deep atmospheric music, where he featured interviews with many famous ambient artists including Steve Roach and Michael Stearns. Oöphoi music can be characterized as being static, organic and minimalistic. It has an overall solid and monolithic feel to it, often integrated in a meditative and spiritual context. Created by using synths, singing bowls, flutes, and processed voices, his recordings have relatively slight harmonic variations. An avid music collector since his childhood Gianluigi started his own music experiments in 1995, with a basic instrumentation, trying to explore the shores of deep space-ambient. His first album "Three Lights At The End Of The World", composed in 1995, was released in 1996 by italian ambient artist Alio Die's own label, Hic Sunt Leones. Oophoi used traditional instruments as synths and sampling machines, but also singing bowls, flutes, percussion (woodchimes, stones, shells, crystal chimes) and processed voices; all his music is recorded using analog-only devices in The Kiva, his studio, which used to be a stall in a XV Century stone country house in the hills of central Italy. Gianluigi Gasparetti passed away in 2013 after a long illness.